A small token given on a special occasion always brings a wide smile on the faces of the receivers. In the long run, wherever the receiver look at the gift, it keeps on reminding about the special event. Promotional gifts of companies serve the same purpose. It is a method of expressing gratitude to the existing customers and drawing attention of the potential customers as well. On one hand you are making the customers happy with something useful for which they do not have to pay and on the other hand, the same gift act as tool to enhance the presence of your organization in this highly competitive market. 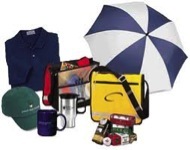 Promotional gifts, with the name or logo of your company, are strong weapon to reach out a large group of consumers. Let’s begin with the basic reason behind these gifts, which is none other than marketing. It has been studied that people remember the name of the company that gave them the product at free of cost. So, if you are eager to increase the brand awareness, promotional products are always the cost-effective marketing solution. These are given out to the customers, distributers, partners and other referral sources. Even the employees of the company are provided with such gifts with the intention of thanking them as well as inspiring them to give their best at work. Hence, promotional products are out-an-out marketing strategy that promotes the goodwill of your organization along with sales. It is important to make your customers and those connected to your enterprise feel special. As a company owner, you should appreciate the allegiance and conviction, which they have developed on your products and services. So, when you are rewarding them a hand bag or a shirt with your company name or logo printed on it, they gladly accept the gift. You can send them a ‘thank you’ mail or flyer but if your customers receive something that they can use, it will be more valued. A study has revealed that if the promotional merchandise has utility, the receiver use it rather than giving it away to someone else. Why not leave a lasting impression with your promotional product? Always choose quality items for your customers. If you believe, quality of a free gift hardly matters then you are actually wrong. This can set a negative impression that definitely harms the reputation of your company. Of course you do not want to compromise on that. It is a wise decision to choose gifts that last for long like pens, coffee mugs, bags, umbrellas and coasters. Be sensible while choosing the long lasting promotional merchandise that fits your marketing budget. The money that you invest for manufacturing the promotional goods must serve the reason. Being one of the important marketing campaigns for any business, this strategy is even a relationship builder. You can expand your visibility from a known horizon to an unknown space. All you need to do is think about the nature of the gift that you will like to present and thereby enhancing the recognition of your company.